You can purchase this course as one 30 hour quiz or as two 15 contact hour quizzes. The original expiration date for this course was January 31, 2019. The course has been reviewed and the date extended. The expiration date is now December 31, 2020. Get a practical introduction to dialysis and an excellent review for the certification exam! 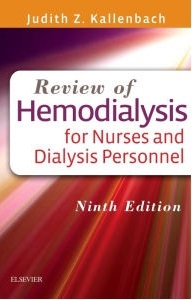 Review of Hemodialysis for Nurses and Dialysis Personnel, 9th Edition uses a concise Q&A format to cover the principles, diseases, and problems of dialysis treatment for kidney failure. Comprehensive without being overwhelming, this book assumes no prior knowledge of dialysis procedures. Two new chapters and five updated chapters keep you current with the latest in dialysis treatment and equipment. Dialysis expert Judy Kallenbach provides clear, easy-to-read guidelines that will apply to every member of the dialysis team, from technicians and nurses to social workers and kidney patients. Comprehensive coverage provides the complete knowledge needed to care for dialysis patients and to prepare for the certification exam, with topics including a review of body fluids and electrolytes, infection control, transplantation, and the important psychosocial aspects of dialysis treatment. Easy-to-understand style introduces new terms and concepts without assuming prior knowledge of dialysis. Question-and-answer format makes learning easier and information easier to find. Coverage of home dialysis therapies prepares technicians for the use of home dialysis treatment as a possible cost-cutting measure. More than 70 illustrations depict all aspects of dialysis treatment and care. Useful appendices offer quick reference to the sodium and potassium content of various foods, the calculation of body mass index, nephrology organizations and resources, a glossary, and more.